Scotmid Co-operative re-launched its Newport-on-Tay store today (29 March 2013), after a major refit to modernise the store and introduce new customer services. 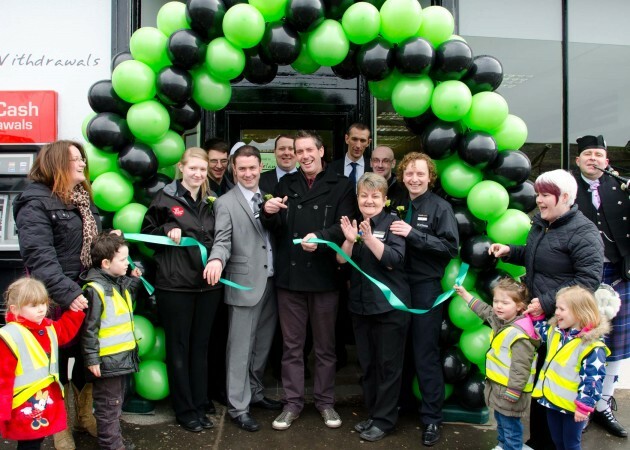 Stuart Webster from TayFM was on hand to cut the ribbon and welcome the first customers to their new look store. Newport-on-Tay Scotmid is the first store in Fife to be upgraded as part of Scotmid’s ongoing modernisation programme. Customers can now enjoy a new in-store bakery from local baker Goodfellow & Steven, specialty breads, fresh ground coffee and a freshly squeezed orange juice maker. The store has also been improved by increasing the range of fresh fruit and vegetables, adding a bigger and better chilled section, and extending the range of wine and craft beers available. A Costa Express installation is coming soon. Healthy recipe cards and wine tasting notes for customers are new additions in store, while the store’s fascia and in-store appearance has been modernised to a striking black and green to improve the shopping environment for customers.